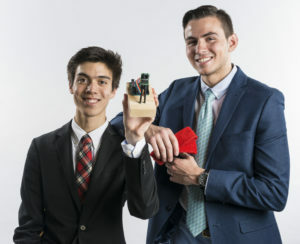 Steven Gerazounis, ’21, and Andrew Fedun, ’21, were sitting in Fairchild-Martindale Library one evening when they realized they would rather be building a business than studying for exams. And thus, Bandz was born. Bandz is a product made for the avid concert-goer who wants to record events to remember later while enjoying the show in the present. It’s a headband with a small camera that wirelessly connects to the user’s phone. The start button on the side allows the product to be easily used without directly using a phone. In order to come up with their business idea, the duo first brainstormed problems they have observed with recording concerts. From there, they worked to identify solutions. Fedun identified the problem of holding phones at concerts and Gerazounis formulated the headband solution. Fedun said he had noticed about a year earlier it was hard to enjoy concerts. “Everyone at the show was focused on capturing videos for social media rather than enjoying the moment right in front of them,” Fedun said. After hearing that Gerazounis felt the same way, they took the idea and ran with it. From there, they entered the Baker Institute EUREKA! 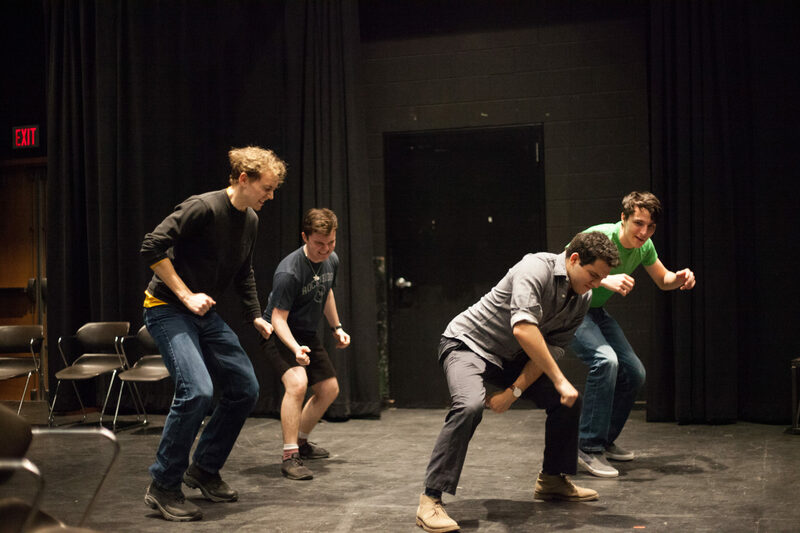 Competition, progressing through all three stages — three-, five- and seven-minute pitches. EUREKA! is a monthly competition where students can pitch their entrepreneurial ideas to a panel of expert judges and can win aid that includes mentorship and financial support. He said the money received from EUREKA! was helpful, as was mentorship by Chris Kauzmann, ’13, ’14G, now a professor of entrepreneurship and design thinking at Lehigh. Kauzmann is also the innovator-in-residence at the Baker Institute. “My primary role is to work with any student that’s working on an innovative idea or wants to solve a problem in the world in an entrepreneurial way, and I sit down with them over coffee or in the office and just talk through whatever their current needs are, next steps, what programs we have available for their ideas going forward,” Kauzmann said. The challenge at the moment is figuring out how to get the video to stream directly to Instagram and Snapchat stories. Gerazounis said their prototype is able to record video on a headband and save it to an SD card, though they haven’t reached a point where they can stream yet. He said the technology is out there, though. “We used the headband when White Panda came to Lehigh and we got good video with it,” he said. As for future plans, Gerazounis said he hopes to try and perfect the prototype as much as possible. He said the team knows there is a market of people who will want the device. They had children come up to them while using it, asking to buy it off them on the spot. “We know we have a product that people want to buy,” Gerazounis said. Kauzmann has a different perspective and is less concerned about the success of the individual project. He is more invested in the people behind the company. He said he is not concerned with whether or not the company becomes a multi-million dollar venture or a complete failure. What matters to him is that Gerazounis and Fedun will have different perspectives on whatever problems they try to tackle. “That’s what I think is going to be a more impactful benefit of Bandz, the affects that it has on them and the way that they are thinking and approaching problems,” Kauzmann said.